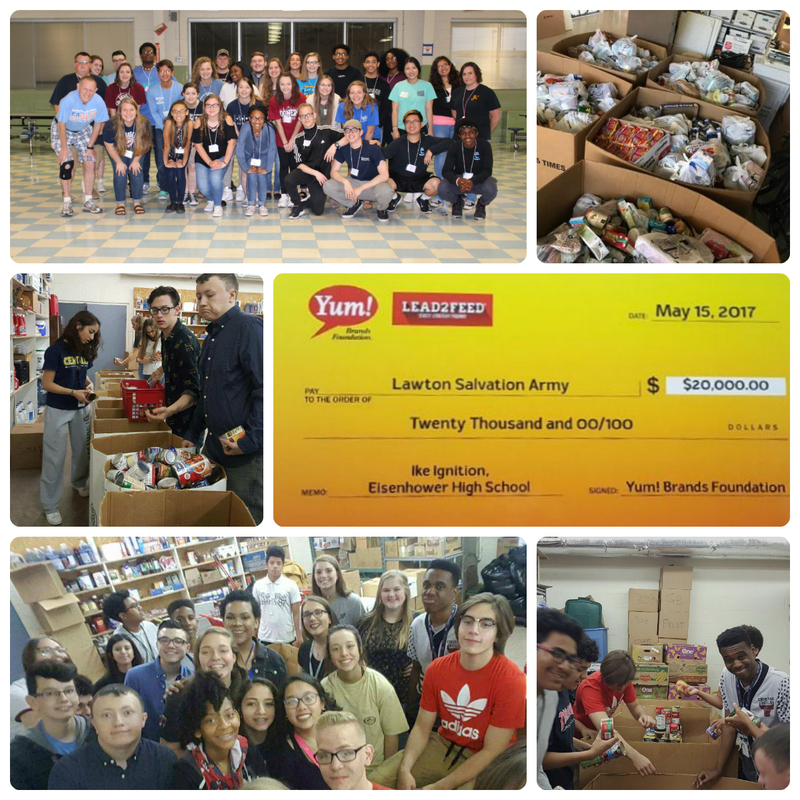 Lawton, OK: Empowered to lead and inspired to serve their school and community, Eisenhower High school won their second consecutive Lead2Feed Challenge. EHS is one of five schools to receive a grand prize award of $20,000 for the Salvation Army, the nonprofit of their choice, and $10,000 for school technology. Having the ability to help support the Salvation Army’s operation “is a big deal” said Ignition sponsor Michelle Churchwell. “Our work doesn’t stop. Hunger doesn’t stop.” Students have provided countless volunteer hours and “the Salvation Army relies on us” to help organize, pack boxes and provide assistance at the pantry. The Lead2Feed Student Leadership Program was created by the Foundation for Impact on Literacy and Learning and the Lift a Life Foundation, with assistance from the Yum! Brands Foundation. The program encourages middle and high school students to hone leadership skills by completing a service project around a community need involving a public nonprofit 501c3. Lead2Feed provided an outlet for students to make a difference in their community, but the life lessons they receive in return are greater than what they give. The students “think about what hunger looks like and they know what to look for in classmates,” said Churchwell. “It matters to the [Ignition mentors]” and they seek out assistance to ensure their peers get what is needed. The prize winnings from the Challenge — over the past two years — will fund four and half years worth of operational cost for the Salvation Army. Ignition mentors will continue their work with the organization throughout the summer. “It’s just surprising to see the power of what partnerships can do for the good of others,” said Roseno. Eisenhower High School has been a Lead2Feed Challenge honoree since 2013. The Lead2Feed student leadership program is the nation’s leading and fastest growing free student leadership program attracting more than one million students from 5,000 schools and clubs across all 50 states.